Yummy, why am I saying yummy? Didn't you read the title, "Lobster and Shrimp Ravioli with a Vodka Crab Cream Sauce." It sounds good just to read, now imagine how it tastes! I made these New Years Eve for Zo, her cousin Dan and myself to enjoy. Then a few days later I made a few minor adjustments that made them even better! I do apologize for not giving instructions for making the pasta for the Raviolis but there are so many different ways to make the pasta and then actual raviolis. I felt that there was no way for me to guess what kitchen equipment was in every kitchen out there. I also figured that if you are up for making Ravioli then you most likely have the equipment needed or you are willing to go out and purchase it. If that is the case then you probably have instructions on how to make the pasta to make raviolis. So if you have what it takes to make Ravioli or you are thinking about trying it then enjoy this recipe! If you are wary, it is not difficult to make your own pasta but it does require some specific equipment to make ravioli. Roll lobster and shrimp pieces in lemon, vodka, dill, chives and essence. In a large sauce pan you melt the butter over medium heat. Once melted add garlic and shallots, sauteing until golden brown. Add lobster and shrimp mixture to sauce pan and cook for 4-5 minutes stirring often. In a medium sauce pan heat butter and shallots over medium heat, sauteing shallots until they are translucent (5-7 min.) Add the crabmeat and saute for about 2 to 3 minutes. Add vodka, fire roasted tomatoes, cream, salt and pepper and cook stirring occasionally for 7 minutes. Add chives and Parmesan Reggiano and continue to cook for 10-20 minutes or until sauce has reduced by 1/3-1/2 or until sauce has thickened and become creamy. There are many ways to make your own ravioli and the way you do so will depend on how your kitchen is equipped. We use a Kitchenaid pasta attachment to make sheets of pasta and then use a ravioli press to make our Ravioli. Depending on how you make your ravioli you will want to place 1 3/4-2 tsp of filling per ravioli. Once you have made your ravioli, gently place them in boiling water and cook for 5 to 6 minutes, or until al dente. 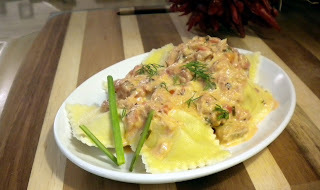 Place cooked ravioli on plate, serve with sauce and garnish with dill and chives before serving. Enjoy!